Could BRT connect White Flint to Northern Virginia? Posted on December 17, 2013 by dan reed! Comments Off on Could BRT connect White Flint to Northern Virginia? For years, there’s been talk of improving transit connections across the Potomac River between Montgomery and Fairfax counties. There might be a solution in Montgomery County’s newly-approved rapid transit plan, and it could be a big deal for White Flint. 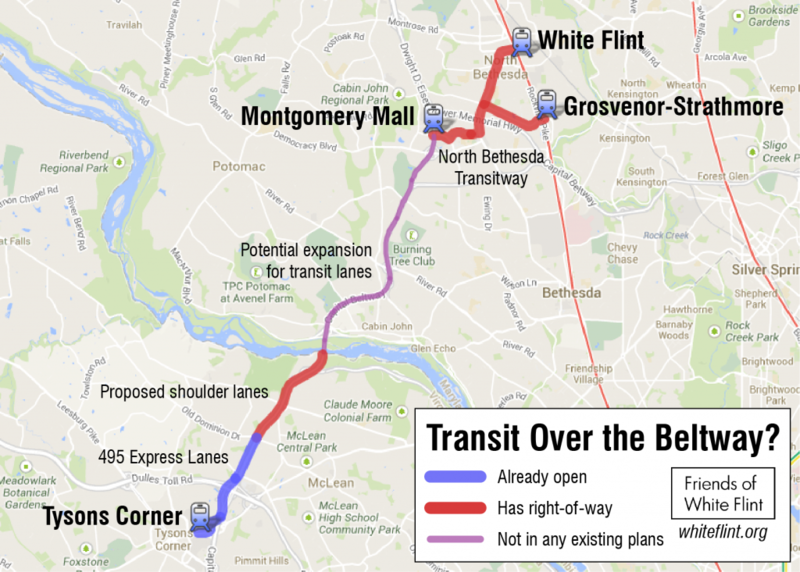 How the North Bethesda Transitway could be White Flint’s connection to Northern Virginia. Click to see an interactive map. 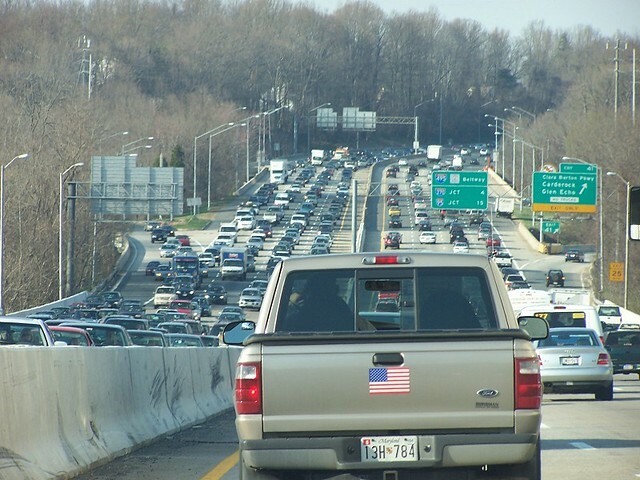 As the sole connection between Montgomery and Fairfax, not to mention a key link on the Capital Beltway, the American Legion Bridge is often very congested, carrying over 230,000 vehicles each day. 30% of those vehicles come from outside the DC area, but commuters still make about 32,000 trips between Montgomery and Fairfax counties during morning rush hour, and 25,000 trips in the evening. Up to 92% of those trips are drivers alone in their cars. Officials on both sides of the river have explored transit as a way to reduce commuter traffic, which could improve travel conditions for everyone. In 1998, WMATA introduced a “Smartmover” Metrobus express route over the bridge, but discontinued it five years later due to low ridership. But as places on either side of the bridge grow, like White Flint and Tysons Corner, there might be a new market for transit. That is, if it’s fast, frequent, and most importantly, reliable. The Smartmover struggled to attract riders for a few reasons. Buses ran infrequently and mainly during rush hour, so they could only serve commuters who worked regular, 9-to-5-type jobs. Buses didn’t get their own lane on local streets or the Beltway, so they often got stuck in traffic, removing one incentive for drivers to switch over. Except for downtown Bethesda, the Smartmover’s stops at Lakeforest Mall, Montgomery Mall, and Tysons Corner were all really spread-out, auto-oriented shopping malls or office parks. This meant riders had to switch to a shuttle or take a long walk to their final destination, giving them another reason to drive instead. And shopping malls aren’t where office workers are headed during rush hour. The service was also very expensive to run. Its destinations are far apart, and in between are low-density, very affluent places like McLean and Potomac that don’t produce a lot of transit riders. Though transit relies on public subsidies, Metro still needs some paying customers from other parts of the route to justify running a bus between them. Since then, a few things have changed that could make transit between Montgomery and Fairfax more successful. One is the White Flint Sector Plan, which will make White Flint a denser, more walkable place, allowing more people to live and work within easy reach of transit, thereby encouraging its use. Fairfax County is doing something similar in Tysons Corner. Together, the two communities might be able to support transit service over the American Legion Bridge. And transit might also justify denser development around Montgomery Mall, creating a third destination that can generate ridership. Traffic on the American Legion Bridge. Photo by BeyondDC on Flickr. Meanwhile, Montgomery County and the state of Virginia are doing things that could give transit its own lane, at least for part of the route. For 20 years, Montgomery County has set aside right-of-way for the North Bethesda Transitway, which would connect Montgomery Mall to the Grosvenor Metro station via Fernwood Road, Rock Spring Drive, Old Georgetown Road and Tuckerman Lane. While working on the now-approved Bus Rapid Transit plan, county planners suggested changing the route to follow Old Georgetown Road all the way to White Flint, which is a bigger office and shopping destination than Grosvenor. Planners have also proposed extending the North Bethesda Transitway to Northern Virginia via the Beltway. The transitway “could become part of a significant transit link between Tysons Corner and White Flint,” they note. At Montgomery Mall, buses could follow a yet-unbuilt ramp from Fernwood Road to the I-270 Spur and continue onto the Beltway to Tysons Corner, where they could connect to the Silver Line, which will open next year. It’s unclear what would happen after that. Earlier this year, elected officials in Montgomery and Fairfax had a rare meeting to discuss ways to improve connections between the two counties. One possibility could be extending Virginia’s 495 Express toll lanes from Tysons Corner north to I-270, which like in Fairfax would be open to buses. Of course, that would be extremely expensive, politically fraught, and environmentally destructive. Like most of the plan, it has no funding, and Montgomery County will have to do more detailed studies and design work before anything happens. Could buses run on the Beltway’s shoulders? A faster, cheaper alternative may be to simply run buses on the shoulder. The Metropolitan Washington Council of Governments has studied whether buses could run on the shoulders of the Beltway, which already happens on Columbia Pike near Burtonsville and the Dulles Toll Road near Falls Church. On some roads, the shoulders will need reinforcing to carry the weight of buses, but it’s something that could happen relatively soon. Across the Potomac, Virginia is already preparing to open the Beltway shoulders to all traffic for about 2 miles south of the American Legion Bridge. The state will rebuild and reinforce the shoulders, meaning it may be able to run transit there one day. But once drivers get used to having the extra lane, it’ll be a challenge to convince them it should be used for buses instead. Traffic on the American Legion Bridge is bad, but only so much of it is commuter traffic. Most of the people who work in Montgomery and Fairfax counties commute from Maryland and Virginia, respectively, meaning they don’t use the bridge. According to the 2011 American Community Survey, 47% of the people who worked in Montgomery County lived there too, compared to 40.6% in Fairfax. Less than 4% of Montgomery and Fairfax workers came from the other county. Some people on the American Legion Bridge are headed to places far outside the DC area, and transit can’t serve them. But there are others who might be headed to shop at Tysons Corner or dinner on Rockville Pike. Transit might serve a purpose for them, but only if it’s available. To not repeat the Smartmover’s mistakes, area officials will have to make future transit service competitive with driving. Speed is one factor, and the dedicated lanes will help that. But the length and frequency of service is another. That means buses throughout the day and night, not just at rush hour. And it means service frequent enough that people won’t have to rely on a timetable. Only then will people feel like they can use transit not just for work, but for all of their daily trips. That could be the hardest part of making transit over the American Legion Bridge work. It will be expensive to run, which requires higher ridership, which in turn requires more service that’s expensive to run. White Flint and Tysons Corner may become dense, transit-friendly places, but it’s unclear for now where there will be enough demand to justify transit between them. Crossposted on Greater Greater Washington. This entry was posted in Transit and tagged Bus Rapid Transit, north bethesda transitway, transit, transportation. Bookmark the permalink.